Unsealed a bottle of great bourbon Dalmore the other day. 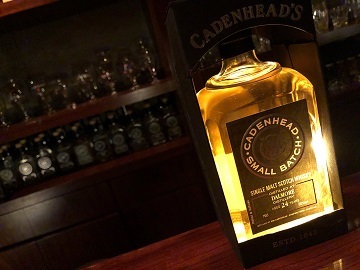 About 4-5years ago, William Cadenheads released for Japanese market through Shinanoya Ltd. This is probably our final stock! Hope you like it. Orange, Warm aroma, Vanilla, Maillard reaction. It smells noble and quite comfortable. The impression, light for Dalmore is reminiscent of a certain distillery in Carron, Speyside. In the mouth, colorful dried fruits, cloves, orange oil, cracked wood, and slight smoke.. There is certainly Highland woods viewing, rather than the Cromarty firth. Dry attack, Smooth palate, Finish is pleasant. There isn’t much of a inflection, but I think it holds components the whisky needs at high level, and completely balanced. More creamy fruit flavors appears as time goes by.